Peritoneal dialysis is an important treatment for kidney failure – when the kidneys stop working properly. Peritoneal dialysis cleans the blood while it is inside the abdomen (tummy). This partly replaces the work of healthy kidneys. Your child will have a catheter (a long, thin tube) into his or her abdomen. Several times a day – or overnight while your child sleeps – a special fluid (liquid) is put through the catheter. The lining of the peritoneal cavity, which is called the peritoneum, acts like a filter to remove extra water, salts and waste products from the blood into the fluid. After a few hours or longer, the fluid is drained out through the catheter. You will be trained how to do peritoneal dialysis at home and how to look out for any possible complications. A team of healthcare professionals will do regular assessments – the amount of time on dialysis and the volume of fluid used will be adjusted especially for your child’s needs. Peritoneal dialysis is often shortened to PD. It is one type of dialysis – the other type is haemodialysis, which uses a special machine to clean the blood and is usually done at hospital or sometimes at home. Before the procedure can start, your child need a procedure to place a peritoneal dialysis catheter (PD catheter) into his or her abdomen. Your child will be given a general anaesthetic, special medicine so he or she can sleep through the procedure and not feel any pain. Ideally the PD catheter should be placed several weeks before dialysis starts, to give time for the catheter to heal. This is called resting the catheter, meaning the catheter is put in but not used for dialysis. However, resting the catheter is not always possible if the child’s kidney function is deteriorating rapidly. In this situation PD may need to be started straight away. The PD catheter is a soft, plastic tube that is about 30–40 cm long. Part of it sits inside the abdomen, and part of it outside. A surgeon makes a small cut in the abdomen to make a small hole. The PD catheter is inserted through the hole into the peritoneal cavity. First it runs under the skin and then it dips down into the lower part of the abdomen. There are usually two ‘cuffs’ along the catheter, which bind to the surrounding tissues to hold it in place. Children usually stay in the hospital overnight or longer to give it time to heal. The place where the catheter comes out of the skin is called the exit site. It needs to be kept clean to avoid infection. Most of the time, peritoneal dialysis is done at home. It may also be done in other places, such as school, other family members’ homes or while on holiday. You will be trained on how to manage your child’s dialysis at home – a team of healthcare professionals will be available to call if you have any questions or problems. If your child is old enough, he or she will also be shown what to do. You will be provided with all of the equipment and supplies you need. This includes bags of special fluid, medicines and cleaning equipment – all of which will be explained. The peritoneum, which is the lining of the abdomen, can act as a filter. The space inside the peritoneum is called the peritoneal cavity or the peritoneal space. There are several stages of peritoneal dialysis. Fill: a special fluid called dialysate flows from a bag, through the PD catheter, into the abdomen. You may be given pre-prepared bags of dialysate, or you may need to mix fluids from two bags. Dwell: the dialysate stays (dwells) in the abdomen for a set period of time. The dialysate contains a type of sugar called dextrose, which ‘pulls’ the waste products, excess water and salts out of the blood and through the peritoneum. Drain: the used dialysate with the waste products, extra water and salt is drained out of the abdomen into another bag, and then thrown away. Each time the dialysate is passed into and then removed from the body is called an exchange. Your child will regularly visit the paediatric renal unit, a specialised unit for babies, children and young people with kidney conditions, which may be in a different hospital, to find out how he or she is responding to the dialysis treatment. The dialysis team will work out the ‘dose’ of dialysis – what is in the dialysate and how much is used – especially for your child. Your child will be checked to find out how much waste is removed from his or her blood in peritoneal dialysis – this is called clearance. This is done with blood tests and by analysing the dialysis fluid. Each person’s peritoneum works differently. Your child may have a test called the peritoneal equilibration test (PET), which checks how quickly his or her peritoneum filters waste products and water. The dextrose in the dialysate can affect your child’s blood sugar level. Your child may have blood tests to monitor this. You will also need to do some tests each day, and record the results in a diary. You will need to weigh your child and measure his or her blood pressure – you will be given specific targets that are right for your child. You will also be asked to take his or her temperature. After each dialysis session, you will need to record the filtration volume – this is the amount of dialysate that is drained out of your child’s body. There are a few types of peritoneal dialysis, which depend on when the exchanges take place. Your child’s healthcare team will speak to you about the best type for your child. This may depend on your preferences, but some children do better on certain types of peritoneal dialysis. In CAPD, exchanges usually take place four times a day, which you or your child – or another parent/carer who is trained – will need to do. There is no machine. Fill:you will put the contents of a new bag of dialysate (dialysis fluid) through your child’s catheter. This is done by gravity. Dwell: the dialysate stays in the abdomen for about 4 hours. Your child can walk around and do activities as normal, such as go to school or play. Drain: you will need to drain the used dialysate out through the catheter. In APD, exchanges take place overnight – usually for about 9–12 hours. A machine, which can sit next to the bed, automatically and continuously moves dialysate into and out of the abdomen. You will be given one or more cards that are programmed especially for your child. For each dialysis session you may need to use a particular card depending on your child’s weight that day. You will need to insert the right card into the machine. Some children finish each night-time cycle with fresh dialysate that dwells in the peritoneal cavity all day. This gives an extra cycle of dialysis and may help protect your child against any discomfort. The machine, can sit on top of a table or desk at home. APD may be a better option for smaller children. If you need more support, you may be able to have assisted APD. A healthcare assistant who specialises in dialysis can come to your home. It may be possible – or sometimes necessary – to change the type of dialysis your child has. This may depend on your child’s health and complications of dialysis, how he or she is responding to dialysis, or your family’s situation. Speak with your child’s healthcare team for more information. Your child’s healthcare team will teach you how to manage peritoneal dialysis and care for your child’s exit site. They will also give you information about what to look for so any complications can be treated quickly. Sometimes fluid does not properly drain out of the peritoneal cavity. This may happen for different reasons. The PD catheter may become kinked or blocked, such as when a child lies on it (for example, rolling over at night) – this can usually be easily corrected. Blood or fibrin (a protein) from the body can get stuck in or around the catheter. A medicine called heparin can be added to the dialysate (dialysis fluid) to help prevent this. Occasionally, the poor drainage keeps happening. This may be because the catheter gets displaced, or omentum (a fold of tissue in the abdomen) gets wrapped around the catheter. Sometimes, the omentum can be removed in surgery – this is called an omentectomy – leaving the catheter in place. Or, the catheter may need to be replaced. Some children who have previously had surgery in their abdomen may have adhesions. If this happens, peritoneal dialysis may need to be stopped. Infection is a serious risk that is caused by germs entering the body. The infection may be at the site where the catheter enters the skin (exit site infection) or inside the peritoneal cavity (peritonitis). Keeping the exit site clean will reduce this risk. Most infections can be treated with antibiotic medicines, which kill the germs. If the infection is more serious, the catheter will need to be removed, and a new catheter placed after the infection is gone. Very serious infections can cause damage to the peritoneum which cannot be repaired. Hernias happen when an internal part of the body pushes through the wall around it and a lump in the tummy can be seen. 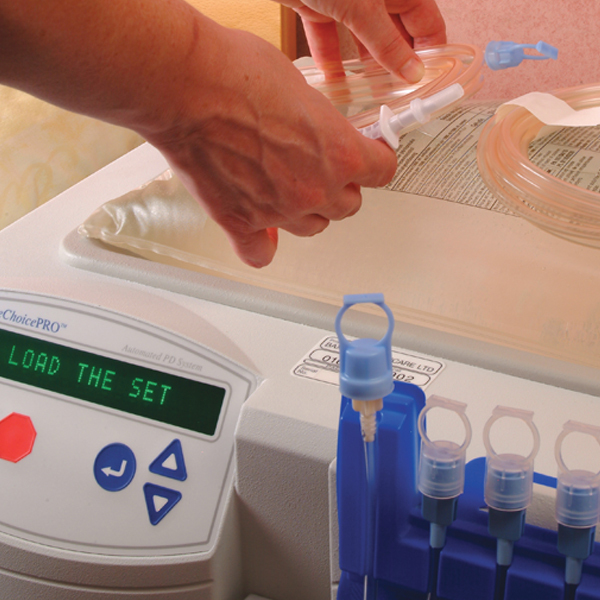 Leakage of the dialysis fluid may happen. This is more likely in babies because they have less muscle, or when the catheter has not rested for long enough. PD can be a difficult and stressful experience for your child and the whole family, including other children. You and your child will learn more over time about how to help live with dialysis. Your child’s healthcare team is there to help you. They can provide support with your child’s education, accessing financial benefits and doing PD outside your home – for example, at your child’s school, other family members’ homes or while on holiday. There may also be help available from a team social worker and/or psychologist. Speaking with other families of children on this type of dialysis can also be a huge support. A peritoneal dialysis catheter (which is often shortened to PD catheter) is a soft, plastic tube about 30–40 cm long, which is placed into the abdomen (tummy). A PD catheter is sometimes called a Tenckhoff catheter. Part of the catheter sits inside the peritoneal cavity (or peritoneal space) inside the abdomen. This part has holes so fluid can easily move in and out. It may have one or more ‘cuffs’ that help to keep it in place. Part of the catheter sits outside the body and is taped to the skin. This part connects to the peritoneal dialysis machine. The area where the catheter comes out is called the exit site. You and your child will be shown how to take care of the exit site and keep it clean, to avoid germs getting in and causing an infection. A PD catheter generally needs to be placed several weeks before peritoneal dialysis starts. This gives time for the body to heal around the catheter. The procedure is usually done by a paediatric surgeon, who specialises in operations for babies, children and young people, and takes place at your child’s paediatric renal unit, a specialised unit for babies, children and young people with kidney conditions, which may be in a different hospital. It usually takes 1–2 hours, though your child will probably stay in the hospital for at least one night to recover. You can bring a change of clothes and some toys and books. Your surgeon will select the best type of surgery for your child. Laparoscopic surgery (also called keyhole surgery) – one or more tiny cuts are made in the abdomen. A long tube with a type of video camera is inserted so that the surgeon can see the inside of your child’s body on a screen and do the surgery. Open surgery – a larger cut is made in the abdomen, so the surgeon can directly access the inside of your child’s body. Children usually need to stay in the hospital for a longer time to recover. Your child will be given a general anaesthetic, special medicine so he or she can sleep through the procedure and not feel any pain. This will be given as an injection or breathed in. The anaesthetist will speak to you about the best option for your child. You will be asked to give written consent, or permission, for the surgery. Your child may be given antibiotic medicines to prevent infection. Your child will be moved into an operating theatre, a room where surgery takes place. Your child will go back to the ward, where he or she will be monitored by a healthcare team – this may be for one or two days, or longer. He or she will have a dressing over the catheter. 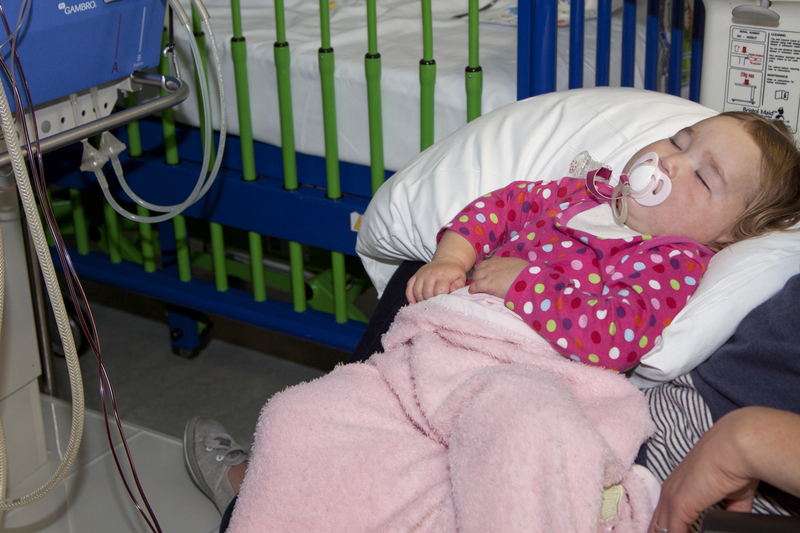 Your child may feel some effects from the anaesthesia, but these do not usually last long. They include feeling sick and being sick (vomiting), headache, sore throat, or feeling dizzy or light-headed. Your nurse will give your child some medicines to help with any pain from the surgery. All surgery has some risks, but these are very rare. There is a risk of infection. Antibiotic medicines may be needed to treat the infection. Occasionally, children bleed from the cut. If this happens your child may need to go back to the operating theatre. Sometimes the PD catheter does not work. Your child’s healthcare team will look for any problems. If these happen, surgery and/or a new catheter may be needed. You and your child will be shown look after his or her catheter – to keep it clean to reduce the risk of infection, and to make sure the catheter stays taped to his or her body so it does not get dislodged or caught in clothing. There is a cap on the end of the catheter, which is only removed during dialysis. Make sure that you, your child or anyone else does not remove or touch the cap. If this happens, contact your renal unit. This is the end of the information on peritoneal dialysis. Further topics about kidney conditions, tests and treatments are available on the infoKID website at www.infoKID.org.uk.